The August WER report has an up-to-date overview of the FSRU sector. The floating regasification sector has been a bright light in an otherwise difficult market over the past 18 months. In the report we provide an overview of the 20 FSRU installation now in operation, 10 FSRUs currently on order and 30 new projects now in the planning stage that potentially require an FSRU. 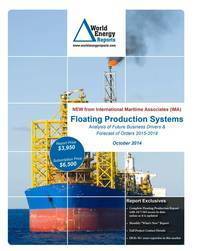 In the data section of the report are details for 240 floater projects in the planning stage, 54 production or storage floaters now on order, 281 floating production units currently in service and 30 production floaters available for redeployment contracts. Charts in the report update the location where floating production and storage systems are being planned, operating, being built and to be installed. Accompanying excel spreadsheets provide the report data in sortable format. Information is current as of 17 August.